"Oh no you dont!!" Ryo screamed as he flash stepped toward them but alas he did not make it in time to stop them.... "Damn... they got away... I failed my mission..."
"No, failure in a mission would mean your death and there life." Yuki said as he walked over to Ryo. "All this means is that the fight must be put on hold until another day. I will report it as a stragety move one that allowed us to gauge the strength and poweress of the two lead Espada. It may not be completely an acurate one but it is one none the less." His tone was calm and gentle then tipped his head and a firm scolding look feel into his features as he could sense the Senkaimon starting to form a bit off. "Although I will be dealing with them and there lack of response time." He said as he crossed his arms. Sakura looked at Ryo and walked up to him even as she shattered the mask into cherry blossom petals. She smiled at him. "Funny thing about proficies wither or not that Espada realizes it. They always have a flip side. A choice in there that you get to make." She looked at him. "You have the choice to not forfill that and make one of your own." She smiled at him and then looked over at Yuki who didn't look at all upset about her being a Viazard, most in Soul Society argued that while Kurosaki was an exception she should not be and loose her sub status. Ryukotetsu looked at Benishihone and shook his head. "You alive still?" He asked which was his gruff way of asking if she was okay. He was known for being a cold and uncaring Zanpakuto spirit. He couldn't help it if sweet affectionate stuff was just beyond him, that question was as close as he could get to caring. Kahiri retreated with Zane smirking and dissappearing to reappear in the gaurganta as it dissappeared well out of Ryo's range of attack even as it closed he laughed and waved bye. Ryo looked at Yuki surprised that he would do this if he told them it was a strategy move he would be lieing to them in truth he tried to fullfill his orders but was completely outmatched in every way... "Zane Mizuama.... things just got a whole lot more interesting..." He looked up at the sky as he said that then he looked at Yuki... "Captain Yuki-san.... you would lie to the higher ups just to save my tail... i'm impressed....."
Yuki looked at Ryo and shrugged. "It's not lieing if that is how I see it happened." he said as he looked at him then watched as first he kissed Sakura wasn't wasn't anything to be worried about then...."Beni.." he said softly moving over. Ryou was almost completely tapped. "Authorize Gentai Kaijo." He said as the seal on his chest appeared and snapped unleashing his immenese spiritual pressure. The very ground around them seemed to be freezing over. But that wasn't his concern at the moment. He glanced at Ryo and took a deep breath before gently lifting Beni's head and kissing her letting his own Reiatsu flow up and right into her. At the moment it was nothing more then energy and Yuki.....had enough for the enterity of Soul Society thrice over, he very rarely ever went without the soul ward in place even in Soul Society his pressure was that immense. Sakura blinked and nodded having returned the kiss but now she was concerned about Benishihone. Despite there meeting she didn't have a problem with the girl and bit her lower lip. Ryokotetsu looked at them and shook his head. The girl would be fine if she didn't reject or refuse Yuki's Reiatsu, she would not hurt him by absorbing it, might mild him out for a few hours but would not harm him. Yuki nodded his head as he sat back and took a deep breath. "Seal Gentai Kaijo." He said in a smooth tone as the seal that held his powers in check once again reformed. He reached over and ruffled Beni's hair. "You enjoy drama don't you?" He mused looking at her. Sakura walked over to Ryo as well he looked so very tired. "Are you alright?" She asked. She was concerned about him. She hadn't been prepared for a battle on that level, it wasn't that she hadn't fought against the espada before it was that she was prepared and normally that would have cost her if it hadn't been for them. She couldn't walk around in this mind set any more. Yuki sighed as he gently squeezed her hand then glanced over at Ryo as he fell face first to the ground having spent everything he had. The other had reached his limit, had the fight gone on much longer it was hard to say who would win. He knew Ryo would have given it everything he had to give and everything he didn't. Sakura sighed and walked over kneeling down in her shinigami robes and lifted Ryo's head so that it was resting in her lap. "You don't have to act so tough for me." She said shaking her head. If he was exhausted he was exhausted. There was no shame in that. IN truth both of them had spent a large amount of energy eariler battling each other, then going to his soul world and now this. It was really no wonder why he was out cold right now. Yuki easily lifted Ryo up into his arms. Seeing the tear fall down and then looked at Sakura. It would do the stubborn Captain of Squad five some good to have her around when he woke up. He turned and began walking towards the Sekaimon. "Come with me Miss Hitsugaya, there is much you need to know." Sakura nodded and walked with him, as she stepped thru she blinked looking around and staring as she was without a doubt stunned at Soul Society she walked with them thru to the grand halls of Zero Division. She followed him as they walked thru having seen Ryokotetsu fade quietly back into his own world back in the living world. She blinked as they walked into the Squad Five barracks and Yuki spoke with the Vice-captain. "This is Sakura Hitsugaya, she is NOT a Ryoka but a guest here. Notify the Gotei 13 as well if she travels outside of our barracks and into the city she is to be treated as a guest and not to be harmed. And notify Toshiro as well...let him know that his niece is here. I think he'd like to meet her no matter how much he and his brother are fighting at the moment." The man chuckled and nodded then walked away to do as Yuki asked. Then Yuki was setting Ryo down in his chambers. "As you heard you are a guest here Miss Hitsugaya, stay with Ryo for now, I will explain all that I an later." "Thank you Yuki." She said not realizing she should be calling him Captain Touhoukuhuu. Not...that Yuki corrected her either. He let Ichigo get away with it months ago after all. Sakura shook her head. "Its dangerous?" She said tipping her head. "I don't understand, Yuki said that I that I could go out in the city and explore a bit later on if I liked." She said confused. Not realizing that even though she bore the substitute soul reaper badge since she had never actually gotten the special clearance to be in soul society that it would be hazardous even with it to be here. Nor did she realize that Yuki had pulled strings to allow her safe passage as a guest. "he said I was a guest within soul society and told this guy with a arm band to notify the Gotei 13 that I was not a Ryoka...oh and to tell my Uncle that I was here." She shrugged lighty then smiled at Benishihone's antics and his own response it was nice to see them both feeling better. "*snickers* Toushiruo Hitsugaya.... I love aggravating him that knuckle head.... me and him are like kids neither one wants to lose...." He looked at then felt his psirit energy he was about a mile off on his way here.... "Whatever you do don't call him a kid no matter what happens!!" Sakura shook her head. "Well I'm glad I'm not classifed as a Ryoka then that would not be fun." She said smiling as she looked at him and held his hand she watched him then blinked. "Huh? Why would I? He's my uncle so he's older then me right?" She asked unaware....of the fact that Toshiro Hitsugaya was short...and had a childlike appearance. Toshiro sighed getting thru the different districts within Division Zero was and had always been a pain even when he had a letter of invite from the head of Division Zero inviting him within the inner santcum. He walked along the halls Hyourinmaru resting against his back. No the part that fried him the most at the moment was that he was trading a day spend around Rangiku Matsumoto for an Afternoon in Ryo Zaran's company. That man knew just knew how to push his buttons and get him going. No...he should amend that it should have been a trade off....except that Strawberry blonde fukutaichio of his heard that he had a neice for one and for the other that she was here in Soul Society and just had to meet her, more over she was as she had put it just going to have to go shopping with the girl. "MATSUMOTO!" Toshiro's low husky voice exploded down the halls not at all far from Ryo's room's. She was driving him crazy of course her insane giggles at his shout weren't helping. She seemed to have this game with him...how far could she push him, make his temper go and how low could she get the air around them but agrivating him. It didn't help him at all knowing this. Ryo heard his voice and a sweat drop went down his cheek Rangiku Matsumoto was with him and she had a habit of..... pushing Ryo's 'buttons' so too speak she would probably do it today then Sakura would be asking question Ryo really didn't feel like answering.... "Damn you Yuki you did this to piss me off...."
Sakura blinked. And looked first at Ryo then at Toshiro....at least she thought he was her uncle and when Ryo said that she was certain but he looked like he was a kid...She remained quiet for the moment. Toshiro felt an eyebrow twitch....even as he closed his eyes and shoulders tensed. Yes it was a typical greating and it annoyed him every time. "How many times do I have to SAY it?" he said as he opened his eyes to look at Ryo. "I"M NOT IN GRADE SCHOOL!" It didn't help that he had recently run into Kurosaki's kid sister Karin and her friends and Karin kept calling him a gradeschooler for days the topic was now a slightly sore spot with him. "OH Taicho!" Rangiku gushed. "She's adorable is this your niece?" She rushed past Toshiro to take up her hands. "Look at her she's as petite and adorable as you are captain!" "Mat...su...mo...to.." Toshiro ground out as he looked at her. "Don't you have work to do?" Rangiku paled and looked at him diving across the room. "No please no Taicho anything but that...I KNOW!" She glanced back at Ryo. "let's all go to a hot spring, please Ryo lets go...it'll be fun we'll bring Sakura and Taichio of course..."
Rangiku pouted when she was pushed away, she had a habit of clinging to all of her guy friends. Then glanced at Sakura who had flushed a bright pink in color at seeing it. And realized. "OH Ryo how sweet!" She said clapping her hands. "Are you to dating? That's wonderful!" Sakura flushed and stammered a few times having a hard time keeping up with Matsumoto. "No thanks. I came to make sure that Sakura was enjoying her stay. Matsumoto you can go by yourself I still have work to be done." He retorted in a cool tone. "Ah but Taicho! It's no fun that way, all of you have to come." She said after her usual greeting with Benishihone. Toshiro's eyebrow twitched at the short comment. "Ryo..." he said in a low warning tone. Eyes closed as Ryo was starting to ruffle his 'feathers' as Rangiku liked to put it. "It's...nice to finally meet you." Sakura said softly. Toshiro looked at her and nodded before thrusting one arm to the side and folding them before him. "Agreed." "Your a Captain?" She asked noticing he was wearing a haori like Yuki and Ryo did. "Yes. Gotei 13, Tenth Division." He said looking at her. "Intellegence division." But Toshiro she noticed was casting a dark look in Ryo's direction as if waiting for him to say something else. "I'm a Tendou!" Toshiro snapped at him. Toshiro was a child genius so intellegent was the one thing he could claim above anyone else. Then narrowed his eyes as both Benishihone and Rangiku went to strangling Ryo with there massive cleavage. He sweatdropped even as he was once again grinding out her name. "Mat..s.u...moto!" Toshiro barked then hollared as she pulled him down into the mess on the floor. "Let go of me!" He barked as he attempted to pull loose of his clingy Vice-captain. Sakura stared. "Um..." She said not sure what she should do. "Ryo.."Yuki's smooth low voice broke into the chaos. "You have the next four days off...'vacation' time as it's refered to." He said, looking at the paperwork in hand and not realizing that at the moment his fifth captain was currently being smoothered by his own Zanpakuto and Fukutaichio Matsumoto Rangiku. Ryo slammed his hand mon the floor three times to get his attention at the two increasing suspicioned girls to be bi smothered him with their breast on the floor thinking... "If you laugh I swear you go down first!......" He started trying to scream the very words he thought but came out as muffled gags.... not that the girls complained.... After a moment he grabbed their sides with Toushirou still scrumbled up somewhere in the mess and picked them all up into the air to say.... "Help me......"
At that they all fell down onto him yet again and he couldn't breathe for the girls breast smashed into his face.... He was smacking his hand around trying to find Sakuras leg to pull onto so he could use her to pull himself out but wound up smacking Toushirou in the face three times but eventually he found her leg and pulled he could only get half of himself out... "Help me Sakura...."
Toshiro grit his teeth and on the third smack to the face knocked his hand towards his niece which allowed him to pull himself out at least part way. Sakura started to reach down but at all the commotion Yuki walked in and around reached down grabbing the back of Ryo's shirt and hoisted him effortlessly from the pile setting him down next to Sakura. "Beni, you do realize suffocating him is not productive to a long life right?" He asked as he went to walk out. "Once again you have the next four days off Ryo. They're calling it vacation." Sakura wrapped her arms about his shoulders and looked at them as if to say Ryo is mine. More over she was trying to make sure he stayed breathing and was terrified he'd get sucked back in like her Uncle. "Matsumoto ENOUGH!" 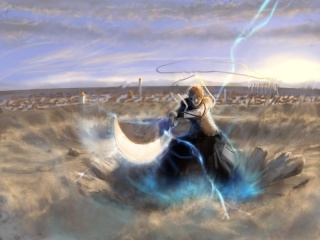 Toshiro barked with incredible force. He could not breath once Yuki had pulled Ryo free he had fallen down so that now his head was trapped between the large bussomed girls..who where cutting off his air flow. He had tipped his head to be able to shout used to Rangiku doing this to him several times a day. Although the air around him was beginning to get frigid. He hated this the most. Being smoothered. "I swear you will be doing all paperwork for the next month if you don't let go now Matsumoto..." he ground out. He would to, She had a life long oath to never left a finger to do paper work and he'd make her do a months worth as punishement if she didn't let go of him right now. "Ryo get Benishihone off of me!" he snapped irrated. Benishihone found her little target then jumped onto his back like she often did and Rangiku clinged from his front side both girls giggling and grinning from ear to ear... "Yuki.... I see a blush is it for me or Rangiku...." Rangiku giggled... "Yeah tell us we wont tell....." Did these two live to get into trouble or cause it? Toshiro tsk'd. "I have no time for such idoicy." He said as he stood up and brushed his robes off. Always trying to act the part of the adult when the adults around him acted childish. Sakura blinked when the two girls seemed to tackle Yuki. Yuki rose and eyebrow. "Neither." He said cooly Benishihone having jumped onto his back had made him blush even more Rangiku clung to his front but saying both would get in him trouble and saying neither would keep them begging which was safer in the long run. He gracefully with both girls clinging to him began walking from the room, glancing back with a look to Ryo that said he would seriously owe him for this one. Sakura stared. "Are they always like this?" "No." Toshiro said calmly as he watched the taller silver haired shinigami leave with both Matsumoto and Benishihone. How he managed to deal with both the girls was beyond him. Then noticed Sakura starting to relax. "There worse." He said in a cool tone. Ryo sighed and looked at her... "Much, much worse especially when your alone dealing with them.... I actually think they do it too get into some trouble...." Ryo looked at Sakura whom was looking at him with death in her eyes..... "W-wait it wasn't me!!"